After what felt like an interminable wait (which shows you my eagerness to receive this Bible), my new PSQ finally arrived. I already own the NKJV full-size Quentel so this review will be mainly a comparison between the two. I leave all the other details to the experts on premium Bibles. I have loved my full-sized Quentel which I received for a Christmas gift last year. The leather has softened wonderfully, the paper feels fantastic when I turn the pages, and the print is perfect for older eyes. The only minus to the Bible was the weight of it when I carried it to church or on vacation. So when the PSQ was announced, I knew I wanted one and my husband (thinking I have gone slightly premium Bible-crazy) bought it for my birthday/Christmas. It is everything I hoped it would be. The size is perfect to hold in the hand and carry to church. It will also slip easily into a large purse (if I want to take the chance of slight damage–not yet!). The print, as others have noted in the reviews of other editions of the PSQ, is very readable even for old eyes for the time needed in church, women’s Bible studies, etc. 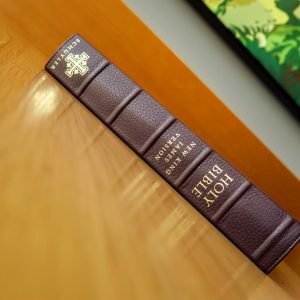 If I were younger, this would be the only Bible I would need, but since I am older, I do prefer the full-size print and slightly thicker paper of the full-size Quentel for my daily Bible reading. The color is the same as my Quentel, but the leather is smoother, less pebbly, than the full-size Bible which fits the smaller size perfectly. I do not miss the concordance in this size as I am not using this for Bible study but for reading. I’m unwilling to write in my Bibles, so the lined pages are not important to me, but I was surprised to see there were a good number of them if that is important to someone. My only regret is that I wished the calfskin came in some other “cool” colors, but I’m sure Schuyler knows what actually sells in various versions. I imagine that NKJV buyers are older and more conservative than other versions, but I really wanted a purple! I also would have preferred this to be black letter like my full-size Quentel, but, again, I imagine I am in the minority of NKJV buyers on this. 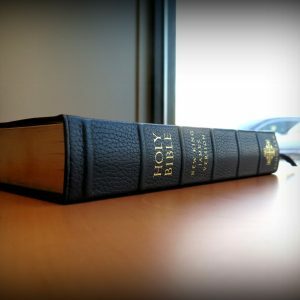 My son was the one who made me aware of this remarkable company, and once I got to see his bible (a full size Quentel) I was amazed by the quality! When I saw that there were calfskin personal versions of this bible to be available, I just had to order one. I am so happy that I did; the bible is beautiful and the quality superb. The calfskin leather is softer than I thought it would be, and its suppleness allows the bible to lay flat even in Genesis (a very important plus!). I love the color of the leather and especially the gilt over blue edges. The text is very readable thanks to line matching. The final touch that put me over the edge was the red lettering on both the verse numbers and Christ’s words. This is a Bible that compels me to read it, and that’s exactly what I need! I recommend this beautiful Bible to anyone. I plan to order a full size Quentel in goatskin someday. Schuyler is the best! I pre-ordered three of the NKJV personal size Quentels, two calfskin and one goatskin, and all three are equally beautiful. 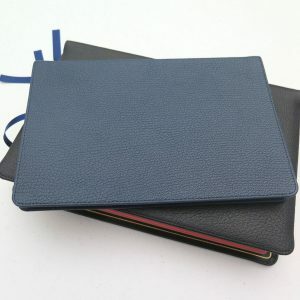 The navy calfskin (as does the black calfskin) looks just as good as my blue goatskin edition, although I know the type of lining construction is not quite the same. The calfskin of the NKJV is a bit smoother and doesn’t have quite as much grain as the goatskin. Both are very supple and flexible. The size and interiors are identical and both editions are premium Bibles. 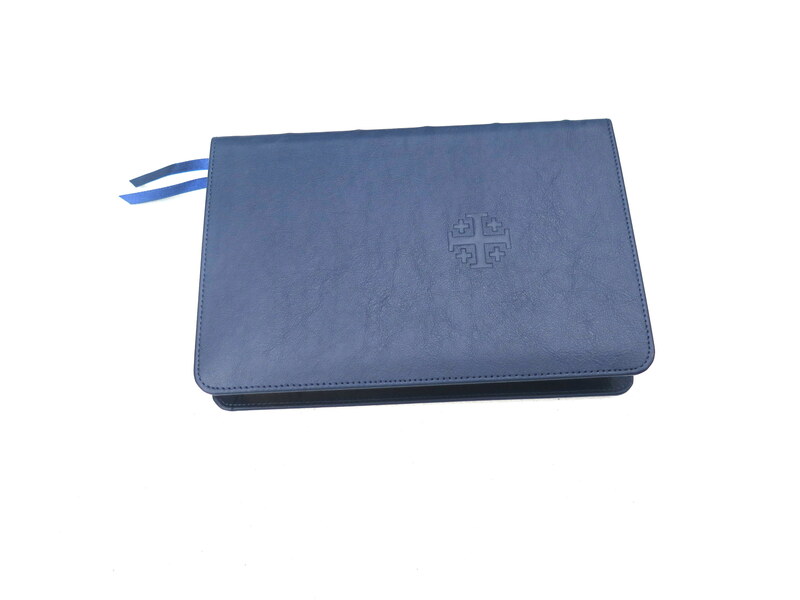 The personal size Quentel is about the perfect carry size and the print is very readable. The red letters are a nice deep red. These Bibles are truly awesome editions of God’s word and I don’t think you could go wrong with any of them. With ordinary care, these should last a lifetime.